‘Beat it up’ is an upbeat street drumming performance group, run by Soundwave, for young people in Workington. The weekly sessions at the Theatre Royal are free to attend and engage hard to reach young people aged 13-19 who wouldn’t normally attend youth activities, giving them a focus and raising their aspirations. As well as learning musical and performance skills, youngsters increase their confidence and develop team work and time management skills. The sessions provide a place to get together and socialise, which helps to reduce anti-social behaviour in the town. The group has been running for several years and to raise its profile to encourage more young people to attend, a £4,000 grant from the NMP Community Fund was awarded in September 2015. ‘Beat it up’ have performed at several local events including the opening night of the refurbished Theatre Royal, the annual ‘Paint the Town Red’ festival and the lantern parade in Maryport over Christmas. 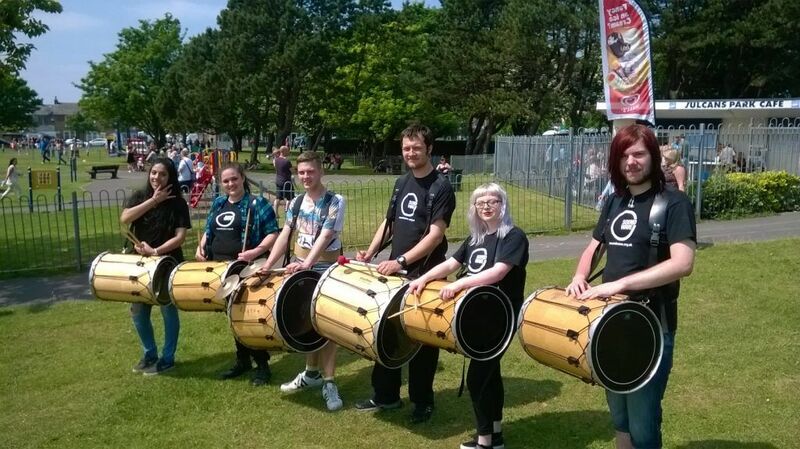 The group was also invited to take part in the ‘Bang Gang’ at ‘Another Fine Fest’ in Ulverston, where they joined in a performance with over 100 other drummers. David Roberts, Programme Leader at SoundWave, said: “Providing weekly sessions has given young participants who may be facing challenging circumstances the opportunity to socialise and learn a new skill which they are able to share with the wider community via performances. The project will continue thanks to further funding from the National Foundation of Youth Music.